For twenty years I bought plants for my garden like a kid turned loose in a toy store, collecting one of everything that appealed to me. I threw myself into developing one area of the yard after another, making new beds, adding more plants, telling myself they were an investment. My design usually started with a basic shape for the new area, to which I added a little of this and a little of that, to see how the plants grew, and how they looked together. The central area in the back yard, a big rectangle that once was a vegetable garden, became such a hodgepodge of various ornamental plants that I think of it as a crazy quilt, with its complex recombinations of color and pattern. Over the years, plants have grown, spread and multiplied. In a friend's garden recently I saw a new little 'The Fairy' Rose. Covered with its one-inch pink flowers, it was about nine inches tall and six wide, with a foot between it and its neighbors, Mine was bigger when I planted it, but it still has made me rethink the bed it's in. Those diminutive flowers are not an indication of this plant's size! It stays three and a half feet high, but it's now six feet across, even after dividing a couple of years ago. You can buy plants already mature, at steep prices, and break your back planting them  but they won't necessarily like your conditions; growing your own gives you some insurance. Though I still like the patterns of mixed plantings, I have also begun to notice the artistic benefits of a sweep of one effect across some extent. It's grander, more imposing; it gives a sense of stability. It's tricky, however, fitting a plant to the whole range of conditions included in a sweep. Variegated 'Ralph Shugert' periwinkle is one I've found; I'm converting the bed which extends across my whole front yard to a sweep of this sparkling groundcover. 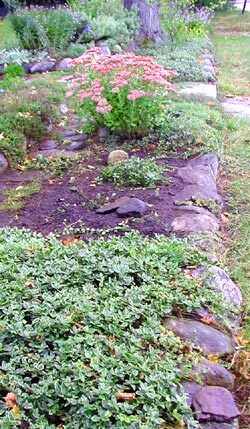 Slowly, I find a new spot for each of the other plants that were there, replacing it with a bit of the periwinkle dug from where it was invading the lawn or the path. Next to move: a big clump of sedum 'Autumn Joy.' This plant too will get a larger area all to itself: it's so good-looking, all year long, in such a wide variety of conditions, that I feel blessed to have such riches.